Welcome to Hog’s Australia’s Steakhouse Gold Coast (Main Beach)! Hog’s Gold Coast is located on the iconic Seaworld Drive. We are surrounded by water; behind us is the Southport Broadwater and a marina full of beautiful boats. Out front is a two-minute walk to spectacular Main Beach and the Pacific Ocean and we are only a short trip up the road from Seaworld Surfers Paradise! Come on into our quirky and cute beach house, full of fun and interesting memorabilia. Nothing tastes better than our Hog’s Tail curly fries after playing in the surf! After hours in the sun, your skin will welcome the shade and your parched lips will savour a humongous Rocky Road ice cream sundae! Looking for a steal of a deal? 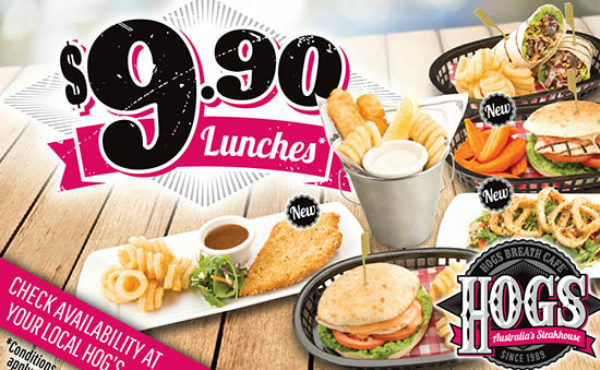 Enjoy an amazing lunch for only $9.90 from Monday to Friday! Or decide to go big, and treat yourself to a tender and juicy Prime Rib steak. Our notoriously generous portions are sure to keep your body fuelled for more fun and adventure on Queensland’s famous Gold Coast!